One of the (very) few signs leading to the Tetrapod Trackway. If you’re a fan of reptiles and amphibians, you can’t be blamed for begrudging Ireland’s sorry lack of cold-blooded fauna. You’re very much in the wrong country if you’re a fan of snakes. As a nation, we have a world renowned reputation for getting “legless” but when it comes to the legless reptiles: ice-ages, climate and an ophidiophobic patron saint have all conspired against them making Ireland their home. Of course it’s not all bad. Our native lizard and three amphibians give the enthusiastic herper a short but sweet list of species to tick off their bucket-list. There’s also the marine visitors such as leatherback turtles, though getting close enough to spot one of these beauties would require a snorkel and a great deal of determination. But there is one, often overlooked, part of our herpetilian natural heritage that can’t run away and, while you will have to leave the mainland, spotting it won’t require that you take a dip in the Atlantic. I’m referring to Valentia Island’s “Tetrapod-Trackway”. The Trackway, as the name suggests, comprises the fossilised footprints of a 380 million year old tetrapod. So what is a tetrapod? A tetrapod is any species of the superclass tetrapoda, which includes the first four-limbed vertebrates and their descendants. In the context of this post, we are referring to those early tetrapods: salmander-like fish that crawled along the bed of water-bodies on modified fins. While we don’t know what species left the tracks at Valentia, we can certainly take a good guess at what it might have looked like. The spacing of the tracks give an indication of the animal’s size (about 1 metre long), and fossils of other Devonian tetrapods suggest the creature would superficially resemble animals such as Tiktaalik and Acanthostega. The Devonian Earth was a primal place, completely alien from anything we might be familiar with today. 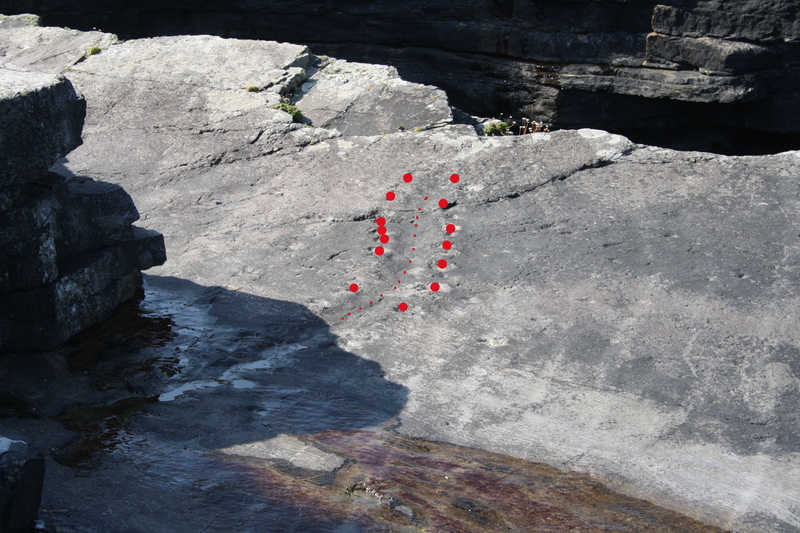 The “Tetrapod Trackway” of Valentia offers us a frozen snapshot of just a few moments from that mysterious world. The Trackway. It can take a minute for your eyes to find the tracks. Credit: Rob O’ Sullivan. The trackway. Highlighted in red. I visited The Trackway for the first time last summer and I wasn’t disappointed. Discovered in the early 90s by an undergraduate geology student, the tracks quickly became an important, if under-appreciated, part of Ireland’s natural heritage. The heritage-site is unassuming and, with minimal signage, it’s easy to miss. It took quite some time to locate, despite the island’s small size, but it was worth the inconvenience as it gave the site a relatively untouched feel . It’s a humbling, almost religious experience to view the tracks of an animal made some 380 million years ago. Trying to place such a time-scale in perspective is pretty much impossible… but I still tried. I started with something a little bit easier to quantify: a human lifetime – about 80 years. I tried to grasp the gravity of that timescale and to truly appreciate how long it is. Then I blinked. I imagined those 80 years were compressed into that split-second and envisioned myself traveling backwards through time at this accelerated rate: After 1 minute, I reached the early Bronze age, which is pretty impressive, but I still had a lot of time-traveling to do. Another hour landed me somewhere in the Middle Paleolithic, where my strange clothes and technology were causing the local Neanderthals to freak out. By the end of the day I had nearly 7 million years under my belt and I found myself somewhere in the Late Miocene. Skip forward to the end of the week and I’m bang in the middle of the Eocene: a world so warm that crocodiles can be found north of the arctic circle. I’m still a long way from my destination and a further three weeks of traveling only gets me as far as the Early Jurassic. That lumbering Stegosaur has me thinking that life may have been stomping about on land for quite some time now and I’m right, because even though I’ve been traveling at 80 years per second for a month now, I’ve only just reached the half way point of my journey. It takes a full eight weeks to reach the Devonian -my final destination. Later that day I found a somewhat simpler way to put that timescale in perspective: I stood at the “Tetrapod Trackway”, stared out at the vast expanse of the Atlantic and reminded myself that it wasn’t there when these tracks were made. The north-east coast of North America and the west coast of Ireland were connected back then, and the land I was standing on was much closer to the equator. That’s a lot of continental drift. There is a tendency, even among those who claim to understand evolution, to distort the reality of our amphibious origins. There seems to be a perception of a very sudden transition from a fish to a true amphibian, as if some ambitious fish stared out past the meniscus of her watery realm and decided that the grass was greener on the other side (Of course I’m speaking idiomatically: grass would not evolve for a further 310 million years). In reality, the process was much more gradual. At first, lobe-finned fishes probably evolved fins with which they could wade through heavily vegetated water bodies. These fins would not have been able to support the animal’s body on dry land at first, but over time their descendants may have been able to manage brief forays onto land before giving rise to a truly amphibious descendant: the common ancestor of all land vertebrates. The animal that laid down the Valentia tracks may have represented something of a dead end in terms of vertebrate life’s efforts to colonise land. Its descendants may never have left the primordial waters that our amphibious ancestor shirked, but they certainly walked (or waded) a common path. Those same adaptations that allowed this creature to wade through a Devonian swampland would eventually be further refined, by our ancestor, into something that could support a body in a terrestrial environment. My trip to the Devonian was captivating, but time waits for no man and I could not evade the pull of the 21st century. I overshot my starting point on the way back, finding myself 2 hours further into the future than when I’d left. Time does strange things at the trackway and we could easily have allowed the rest of the day to dissolve away, but Kerry’s other wonders were calling to us and we reluctantly climbed back into the DeLorean (My travelling companion’s green Toyota Corolla) and left the trackway behind. It may have taken us a while to find the trackway, but with views like this we weren’t complaining. Valentia Island itself is beautiful and well worth a visit. Nestled between Cahersiveen and Waterville along the famed Ring of Kerry, Valentia is but a short drive from a whole host of great tourist attractions (Nearby Glenbeigh is home to one Ireland’s most stunning beaches and the town of Killorglin plays host to the world famous Puck Fair every year). Valentia’s capital, Knightstown, is a beautiful harbour, home to quaint cafes, restaurants, bars and hotels. The island also has some great historical attractions such as the site of the first transatlantic cable. The Atlantic pounds the rocks just metres from The Trackway. The scenery is spectacular, particularly the majestic views of the Atlantic, and if you’re lucky enough to get the kind of weather we were graced with during our visit, it will be all the more beautiful. This Cafe/Book Shop in Knightstown was a charming place to refuel. Like any traveler, I felt compelled to commemorate my visit by purchasing a souvenir from one of the local shops: a postcard depicting those tracks from another age. Like every trinket I’ve picked up on my travels, this one soon found a home somewhere behind the sofa, the fridge or one of the other unexplored frontiers of my apartment. But I also brought something away from Valentia that cannot be lost: An epiphanic realisation of my own place in time, and the countless miracles of nature that led to my being here. There is a strange sense of peace to be found in those moments where you comprehend your own insignificance in the greater scheme of things – the comforting notion that whatever else your legacy might be, it is ephemeral. For all our efforts to leave our mark on this world, we will be forgotten in the blink of an eye… while the simple footprints of a long dead fish will remain – immortalised in stone.